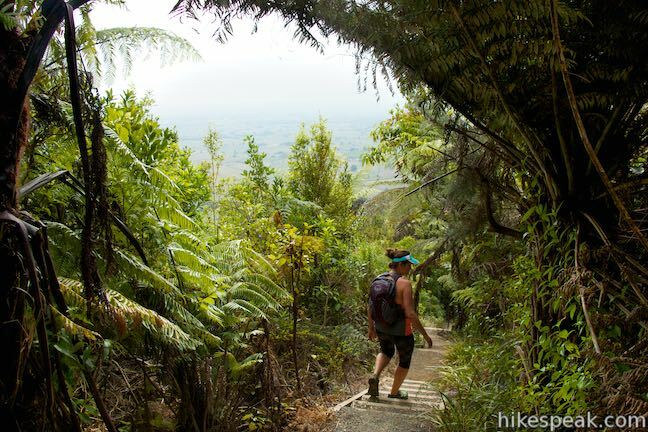 Kakepuku Track offers a farm-to-summit trek in Kakepuku Mountain Historic Reserve. 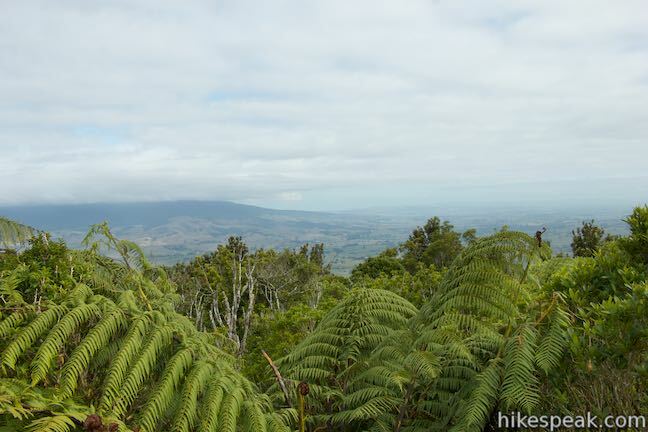 The track to the summit of Kakepuku Mountain is 8 kilometers (5 miles) round trip with 407 meters (1,335 feet) of elevation change. 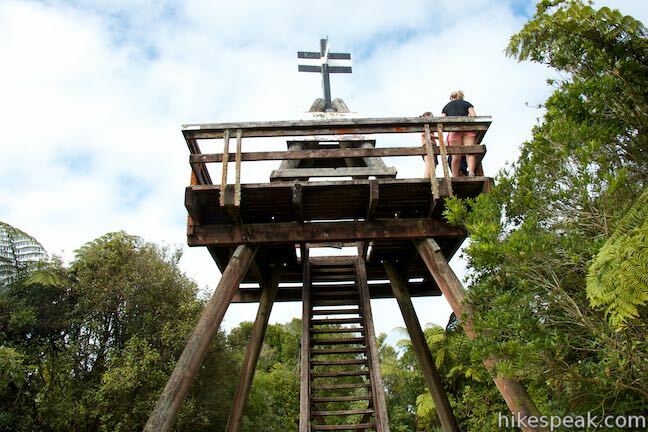 A lookout tower atop the 449-meter summit garners round-the-compass views above the treetops. 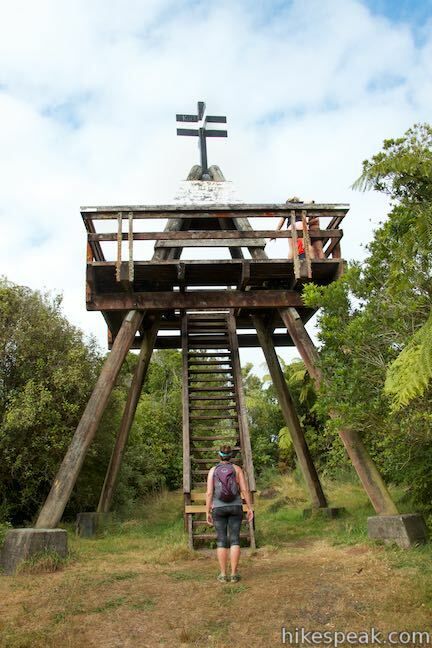 A wooden viewing platform and benches along the track provide spots to relax and look out over the mountain’s current surroundings, while panels placed at pa sites around the summit allow visitors to appreciate the Māori past. 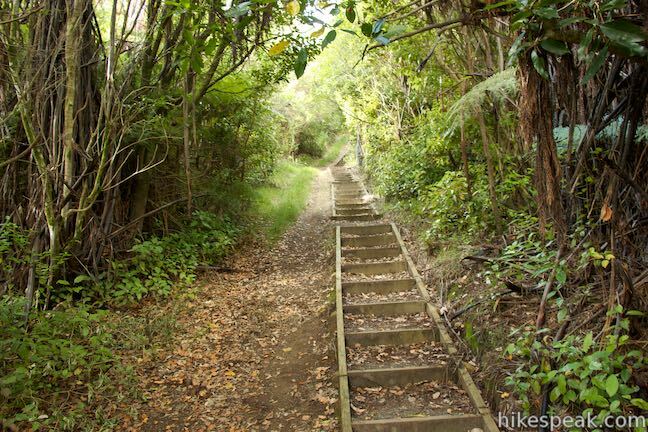 A walk up Kakepuku Track is good exercise. 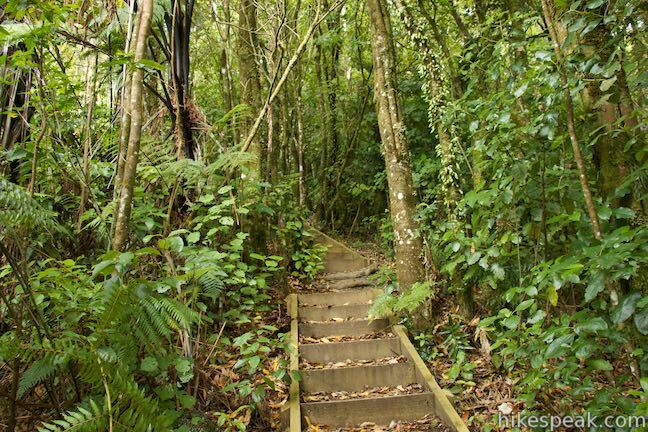 It is all uphill with over 400 wooden steps on the final, steepest section of the track to the mountaintop. 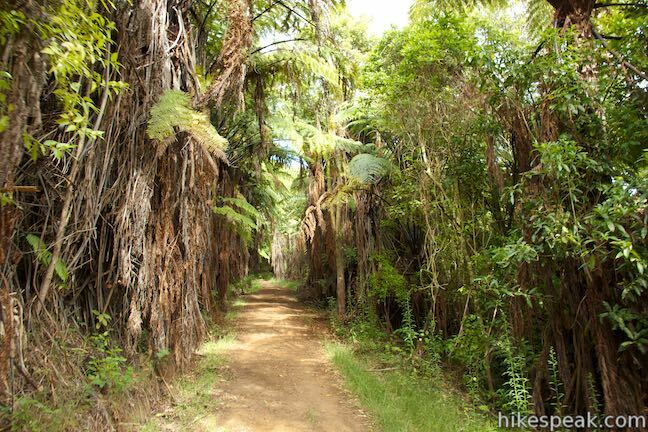 Kakepuku Track is located in a pastoral area on the North Island of New Zealand near the town of Te Awamutu in the Waikato Region. 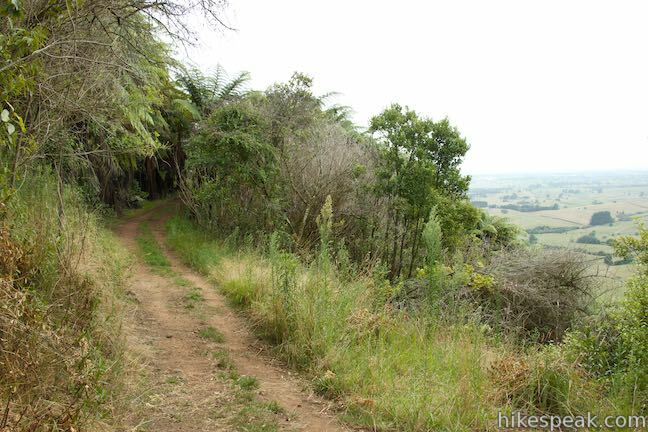 The track begins as a double-track jeep road up the center of a strip of trees between farms. 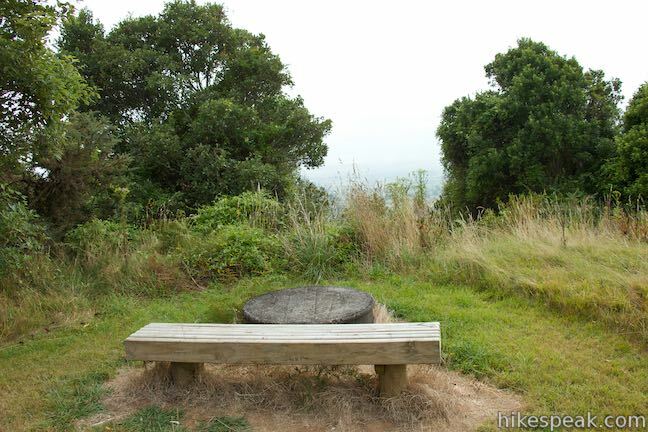 There is a privy and a picnic table near the start as well as a bench a short distance up the track. 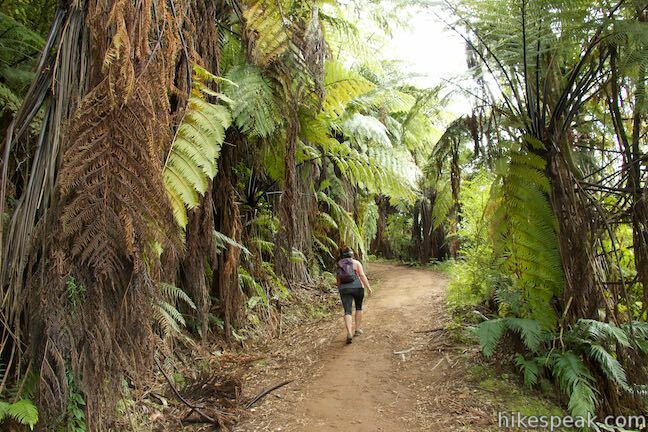 Over the first 500 meters, the track heads gradually uphill on a slope beneath the south side of Kakepuku Mountain. 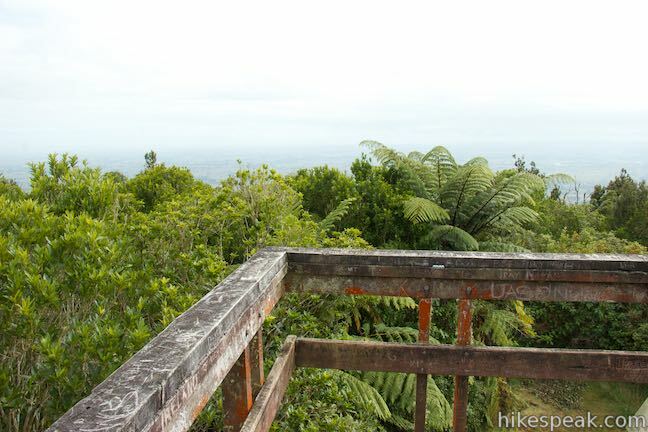 Just as the terrain is about to get steeper, a wooden viewing platform appears on the right. 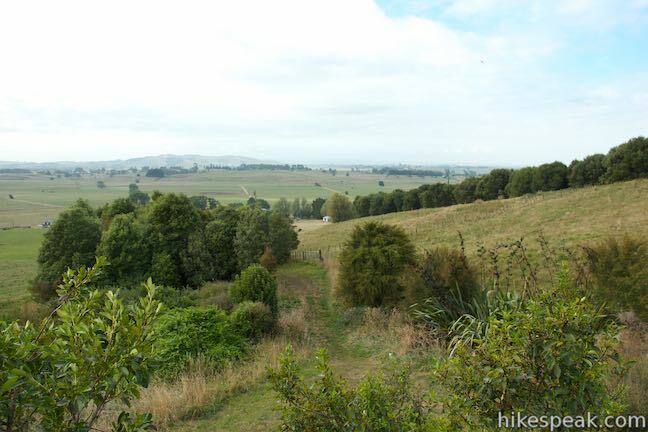 Walk up a flight of stairs to this perch for a view over the surrounding farmland. 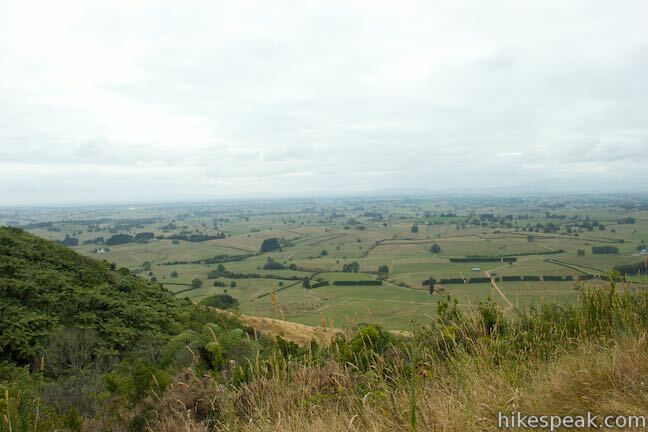 To the east, you’ll see the small 214-meter tall summit of Te Kawa and a few other short green hills that dot this 180-degree view across a fertile landscape. 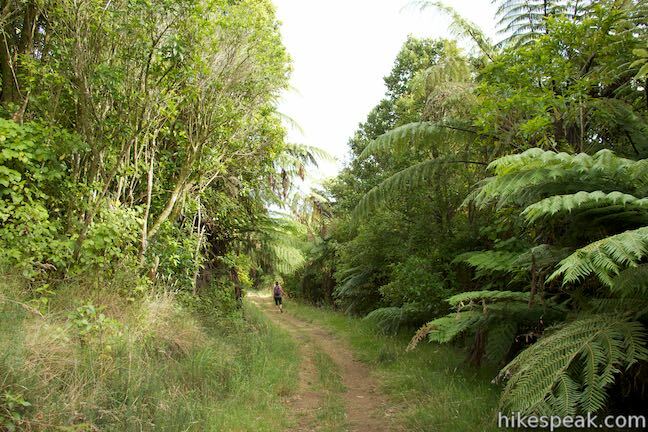 Continue up the wide trail, bearing right past an out-of-use trail up Kakepuku Mountain to stay on the old farm road. 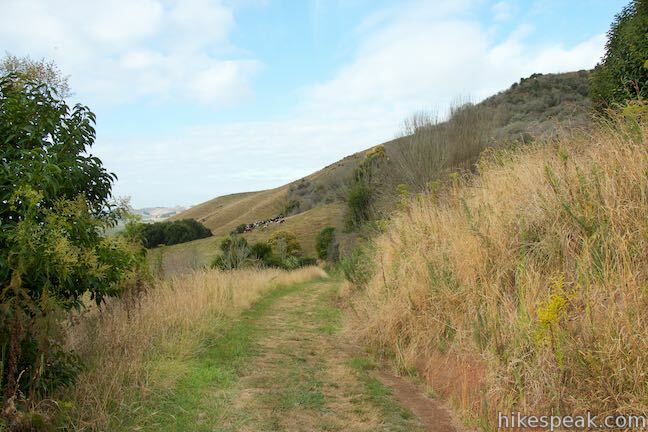 The track ascends through a pair of switchbacks, leaving grasses for denser brush. 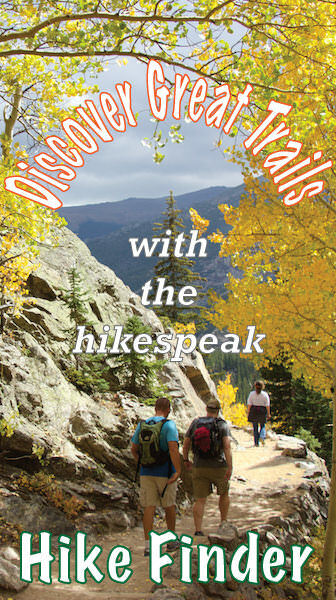 There are patches of blackberries along the track, so you can grab a yummy snack in season. 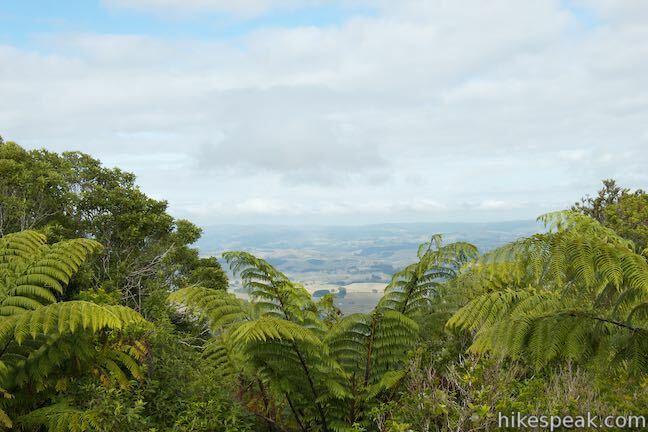 Get some bigger views over the farmland as the track passes in and out of forests lined with tree ferns. 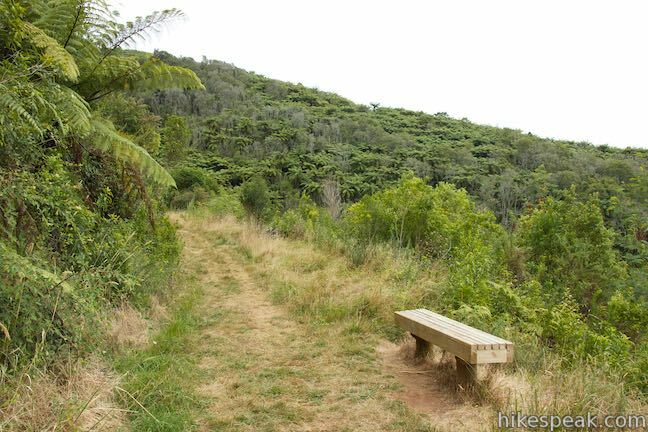 At a second bench, 1.95 kilometers from the start, get a small tree-framed view over the surroundings. 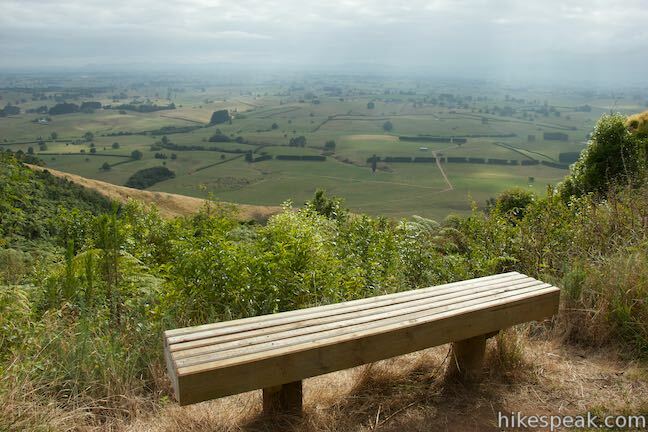 Continue up the trail through more twists and turns to a third bench that has excellent views over the farms and paddocks to the east. 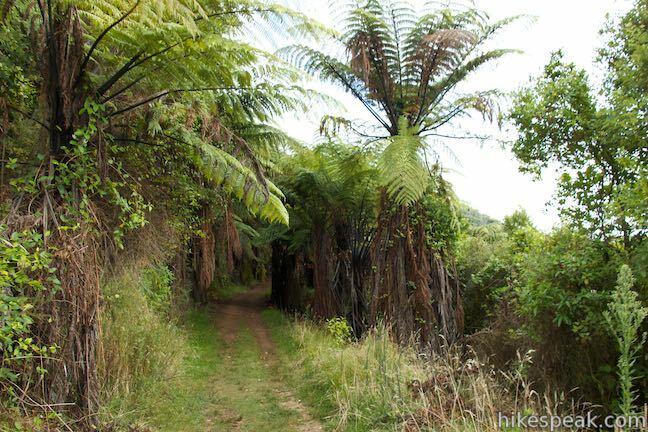 Weave northwest up the mountainside, crossing more woodland slopes. 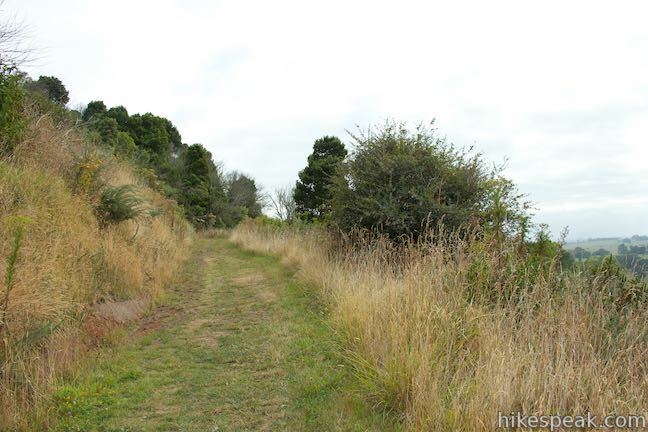 At 3.4 kilometers from the start, the track makes a sharp swing to the left. 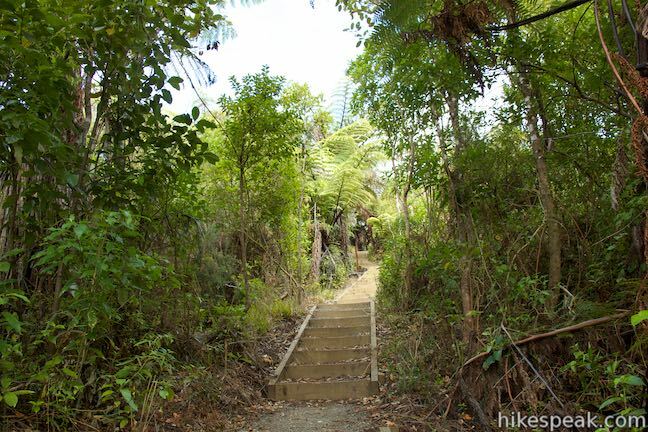 The ascent is more serious from this point on with lots of wooden steps. 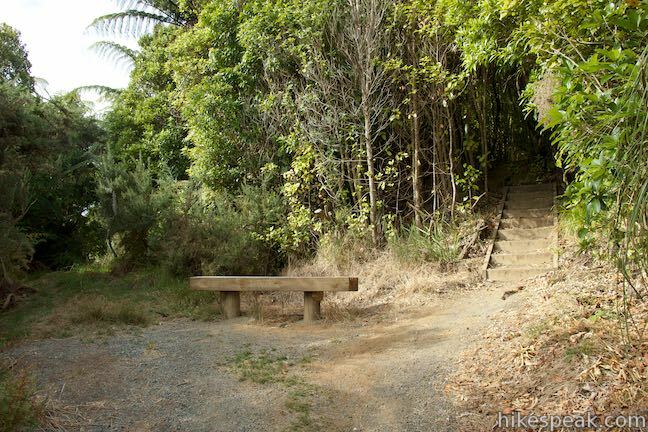 After marching up about a hundred steps, you’ll reach a fourth bench along the track. 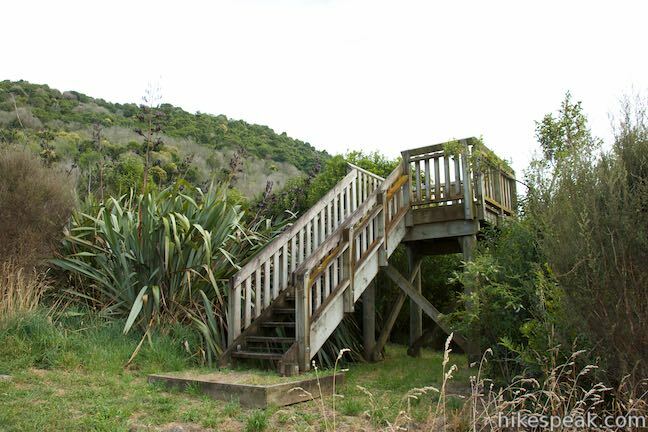 A posted sign states the bicycles are prohibited from this point on. 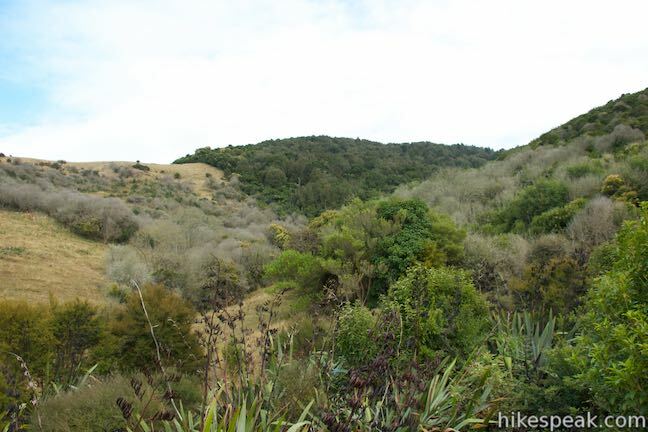 Kakepuku was once densely settled by the Māori but by the 1860s, there was no one left living on the upper mountain. 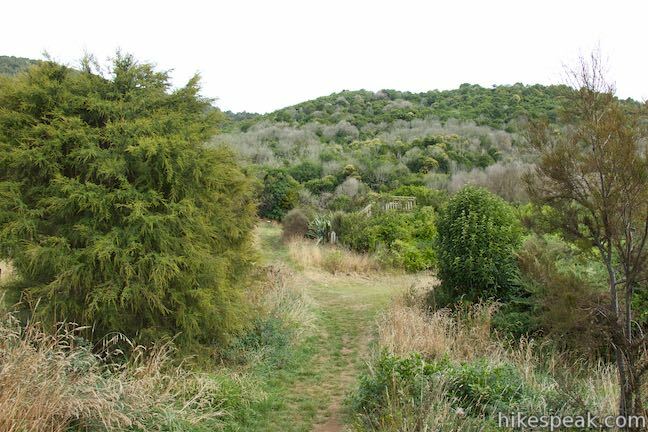 However, the area was still cultivated and peach and fig trees grew all the way to the summit. . . . A reserve was created in 1913 and the bush started to regenerate. 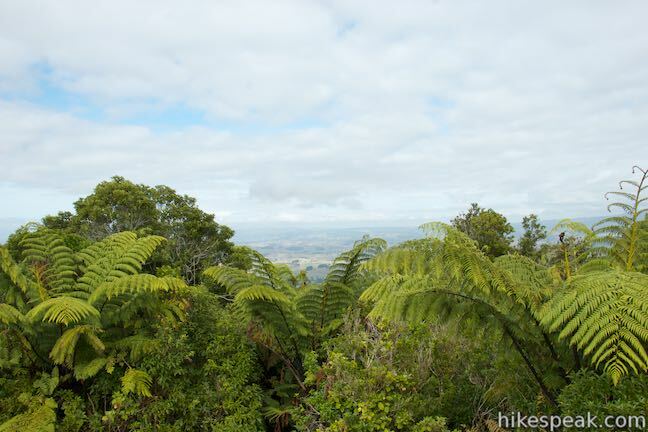 Today, the canopy is dominated by tawa with scattered mangeao, rewarewa and pukatea. 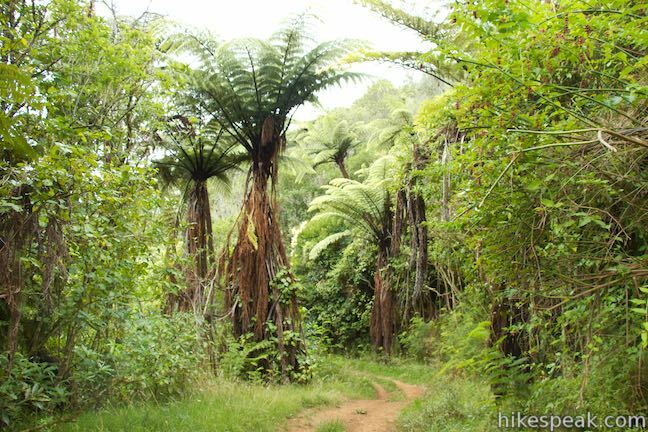 Common understory species include kawakawa, mahoe, hangehange, nikau palms, and a variety of ferns, including para, the rake king fern. 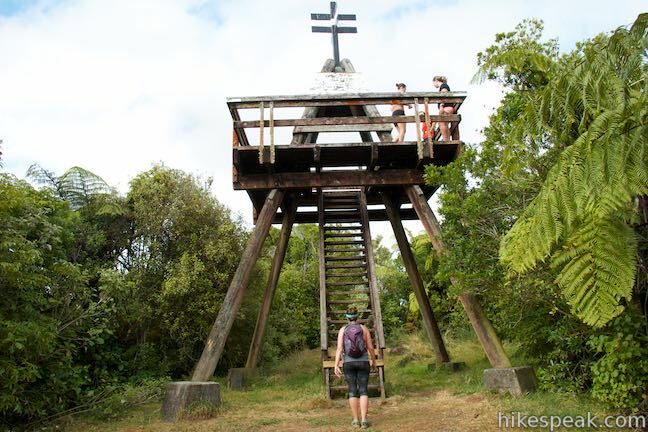 As it is covered in trees, Kakepuku Mountain would not offer any views without the tall lookout tower and trig station at the top. 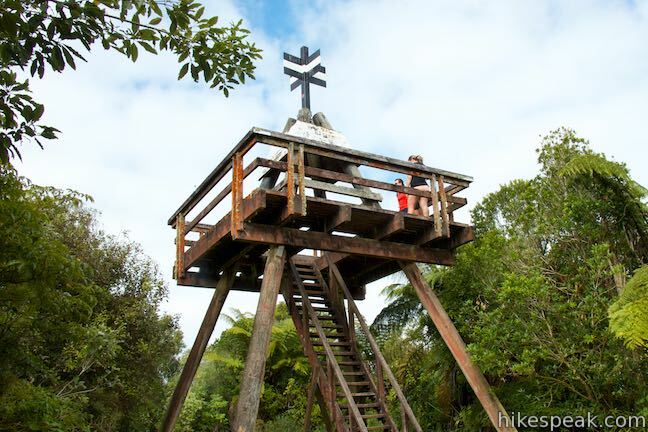 New steps climb around the outside of the lookout tower to a platform near the top. 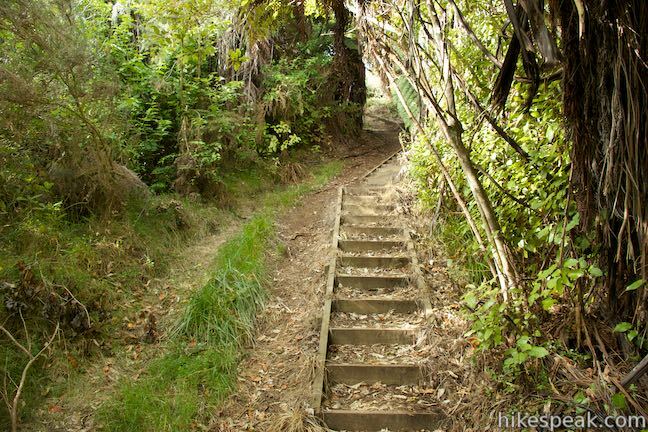 These are the final steps on the hike up. 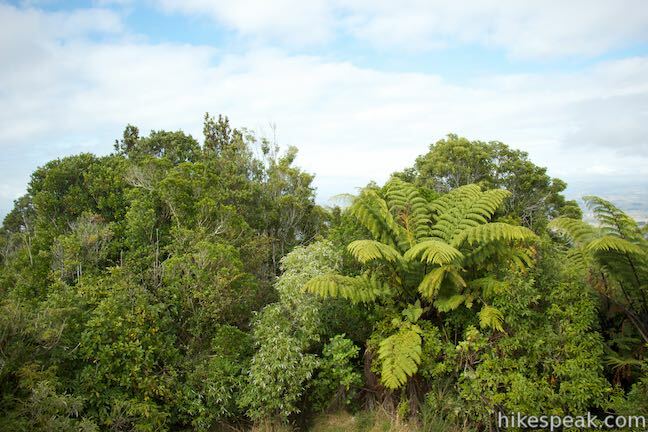 Take them up to a perch at the same height as the tops of the trees. 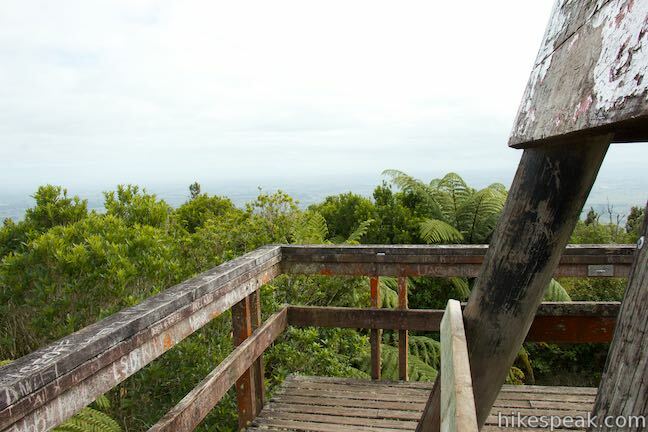 Walk along all four sides of the platform and scope out panoramic views above the canopy. 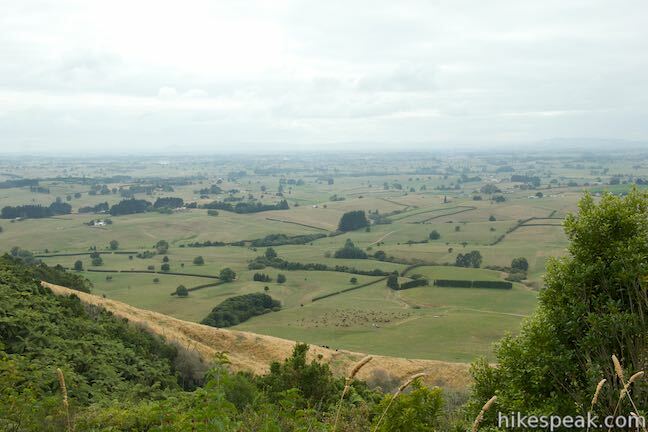 Even on cloudy days, lots of surrounding farmland can be seen. 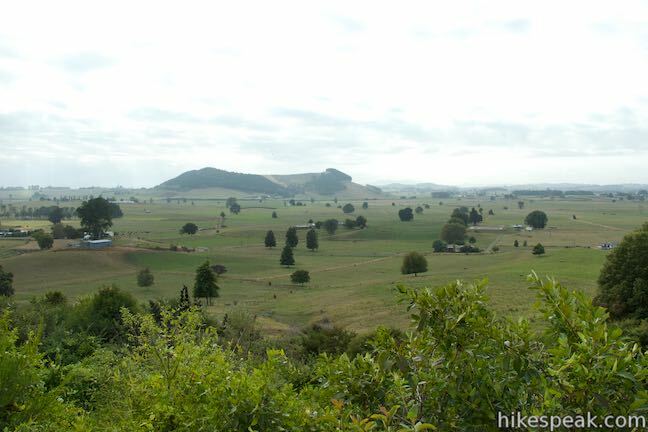 Mount Pirongia rises to the northwest. A couple harbors along the coast to the west should be visible as well. 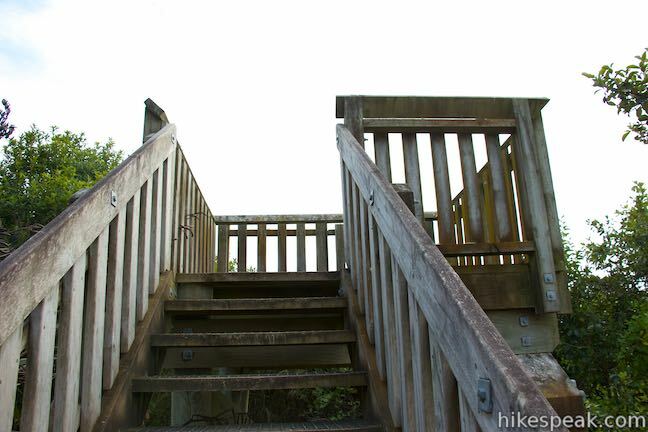 Note: since the time these photos were taken, improvements have been made to the lookout tower, including a large new staircase and railings. 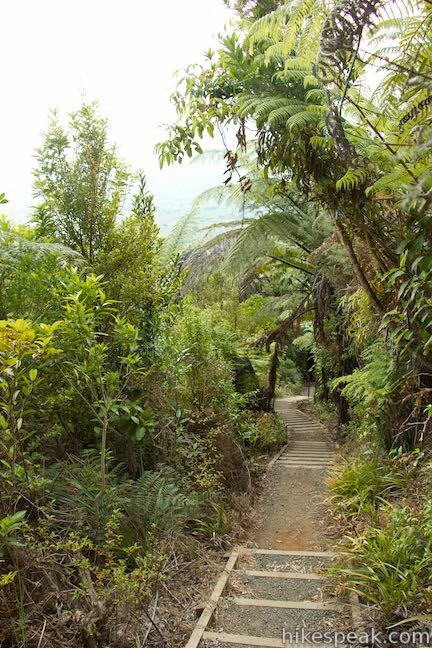 Take the track down from the summit and return the way you came. 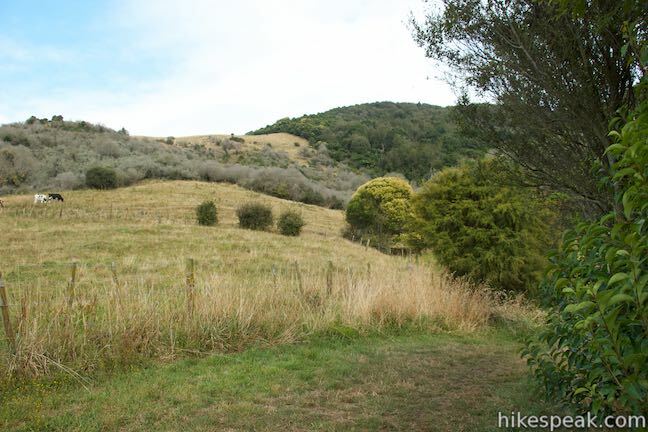 It is all downhill from the summit to the car park. 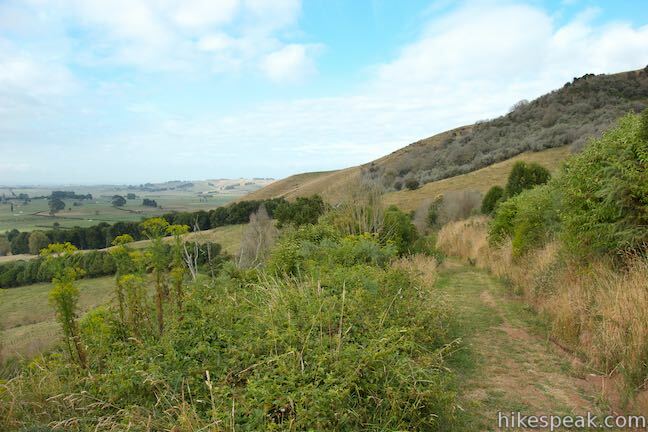 Dogs are not allowed on Kakepuku Track and bikes are only allowed on the first 3.55 kilometers. 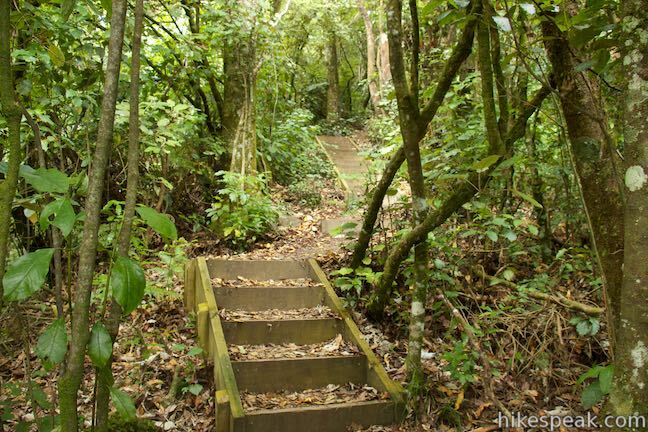 Kakepuku Mountain Historic Reserve is free to visitors and no permit is required to hike Kakepuku Track, so get out and enjoy! 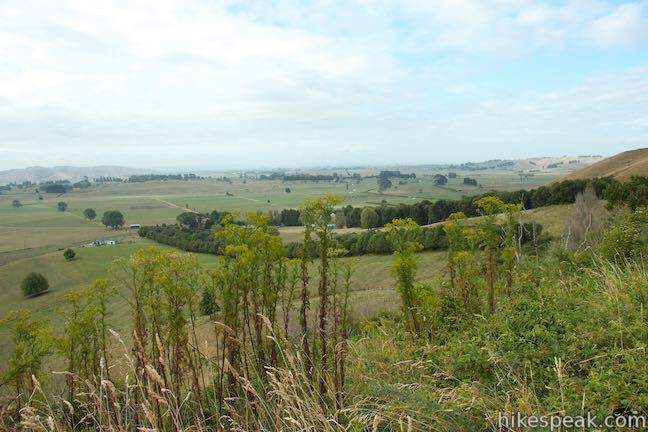 Directions: Follow State Highway 3 to the south side of Te Awamutu and head west on Bridgman Road. 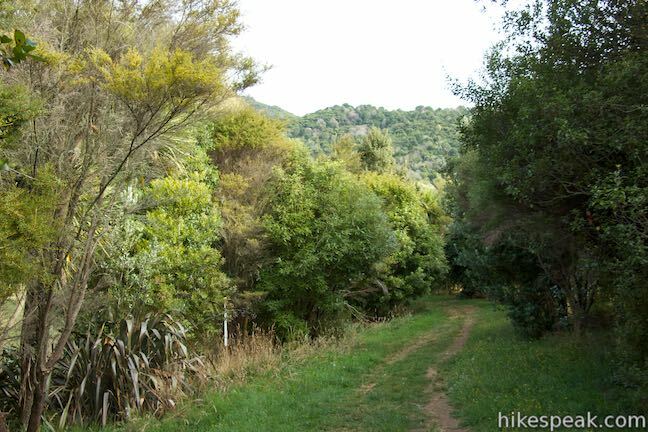 After 260 meters, bear right to stay on Bridgman Road. 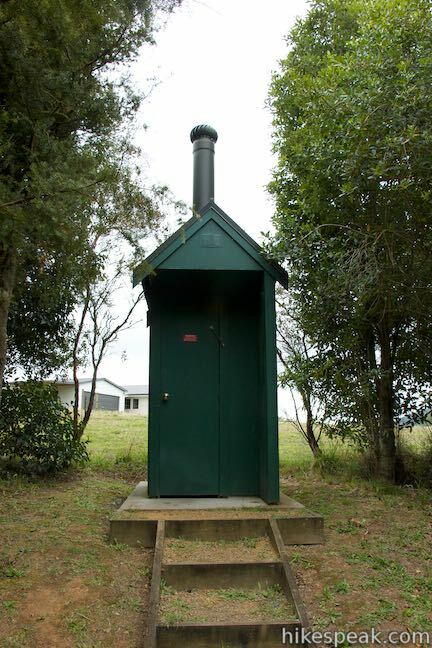 In another 280 meters, turn left on Puniu Road, which becomes Pokuru Road after 650 meters. 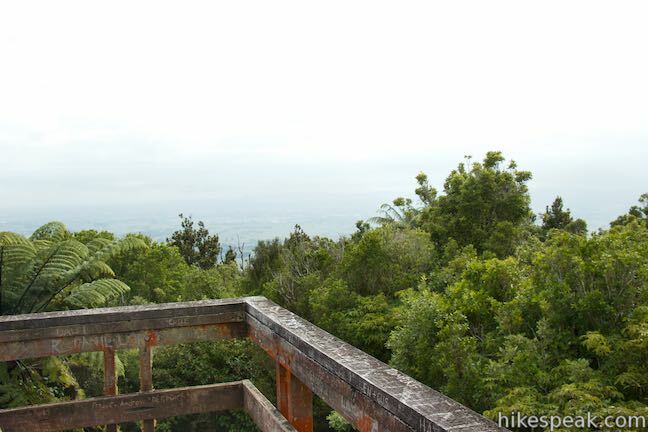 Drive another 5.2 kilometers and turn left on Te Mawhai Road. 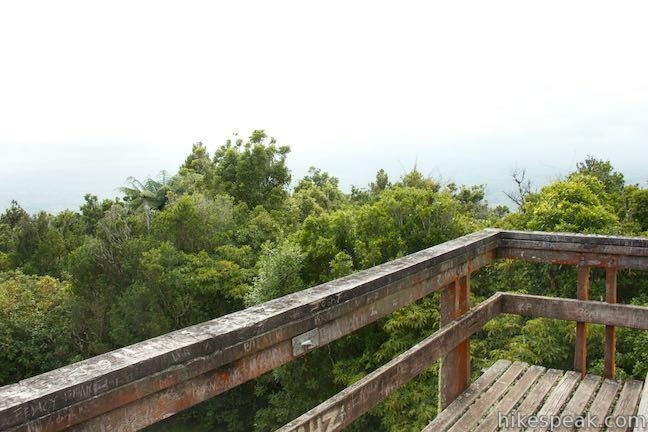 Go 1.2 kilometers and turn right on Kakepuku Road. 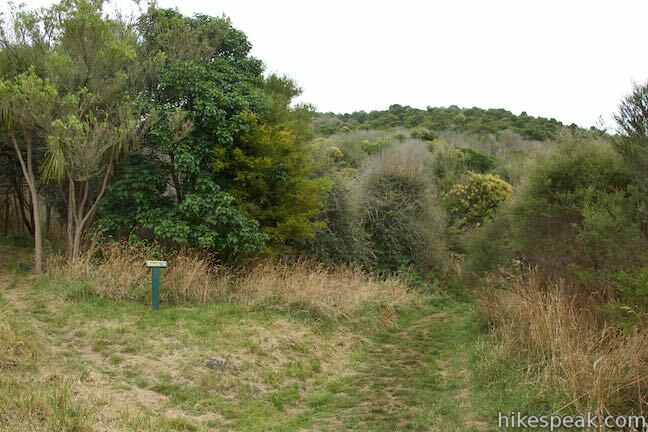 The car park for Kakepuku Track is on the right after 3.6 kilometers up a short driveway. 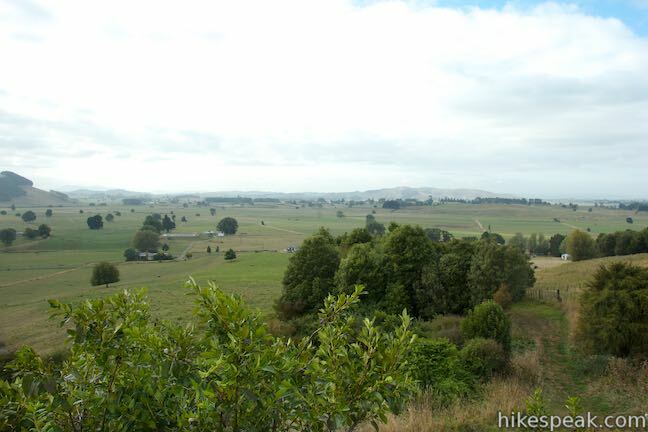 Or view a regional map of surrounding New Zealand tracks, campgrounds, and lodging. 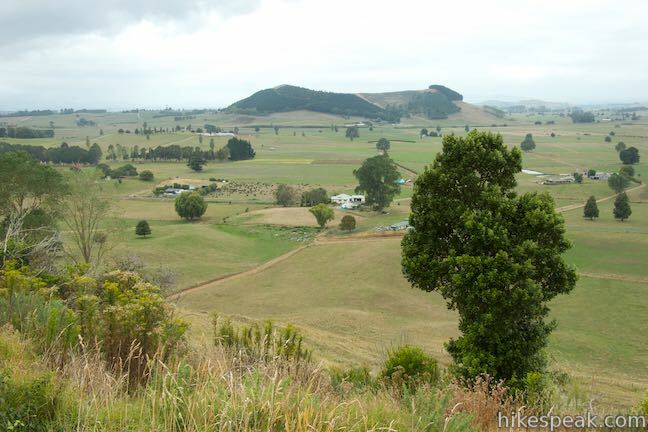 Fantasy becomes reality when you visit the filming location for Hobbiton from The Lord of the Rings and The Hobbit. 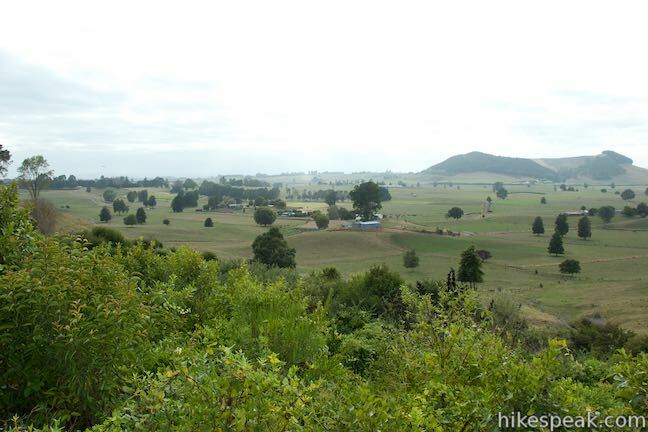 See Bag End, get a drink at Green Dragon Inn, and walk past hobbit hole after colorful hobbit hole on a tour through Hobbiton Movie Set. 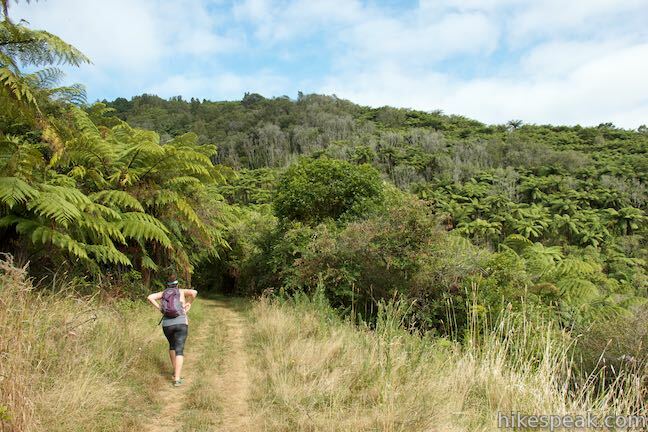 Explore other destinations for walking and hiking (as well camping and lodging) in New Zealand. 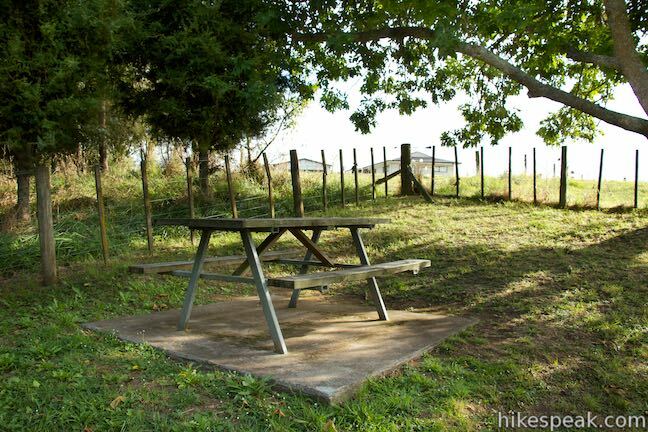 This motor lodge in the town of Te Awamutu is halfway between Hobbiton and Waitomo with studio and one-bedroom units with lots of conveniences for travelers. 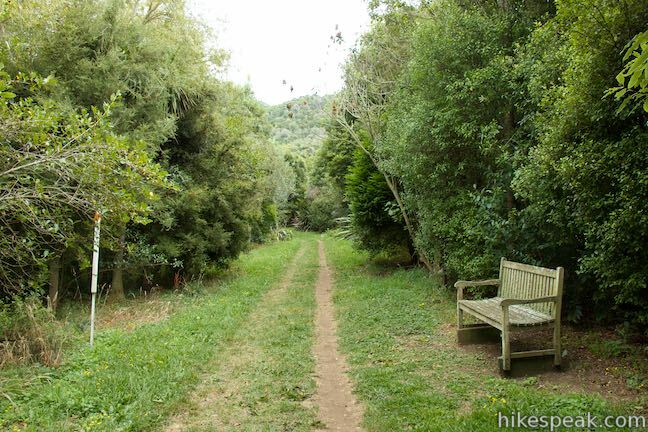 This lodge near Lake Taupo blends comfort with luxury and has welcoming owners who can help you take advantage of the area's abundant outdoor opportunities.